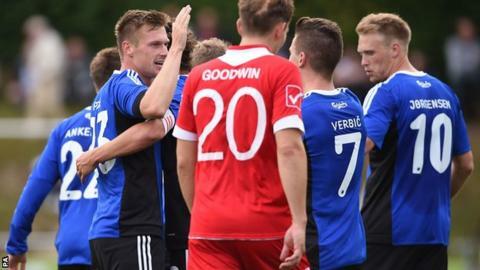 FC Copenhagen were much too strong for Newtown as they progressed to the third qualifying round of the Europa League. Leading 2-0 from the first leg, the visitors eased further ahead as Marvin Pourie headed in Kasper Kusk's cross, and Nicolai Jorgensen's 40th-minute penalty gave them a 2-0 interval lead. Pourie's second early in the second half emphasised the gulf in class. But Tom Goodwin's tap-in for Newtown brought the biggest cheer of the night in spite of the 5-1 aggregate score. Four years ago Newtown were close to going out of business, but reached the Europa League by winning a play-off with Aberystwyth Town. A two-leg win over Valletta of Malta earned them a draw with the Danes who played in the group stages of the Champions League in the 2013-14 season. Newtown manager Chris Hughes said: "I'm really really proud, not just tonight but of what's happened in the last month. "To win a first qualifying round tie was a huge achievement for this club. "And to come up against a team who were playing in the Champions League two years ago and go out there and play the way we did - I think the players acquitted themselves really well."